"My parents don't want anything to do with me. It has been just a few days since I have been discharged and we have no support. I have to do all the household chores, travel to the hospital where I get to see my babies for just two hours, and then come back home to the same routine." Vijayalakshmi is going through a situation she hopes no other mother ever faces. 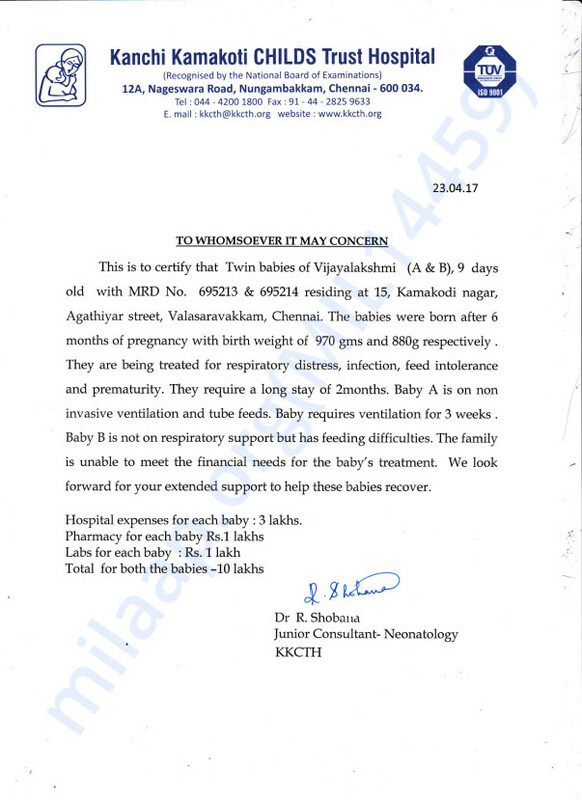 A complication necessitated preterm C-section and delivery of twin babies. 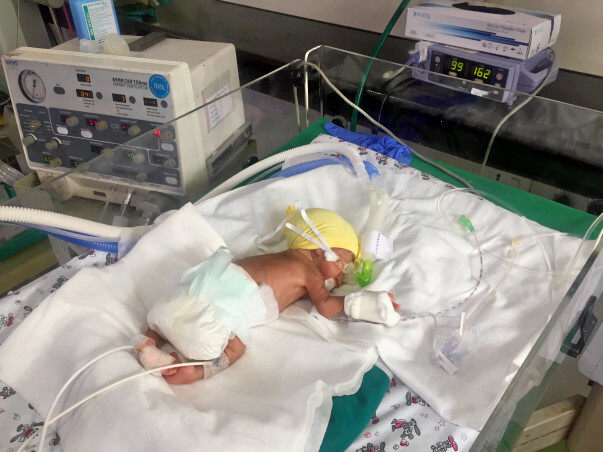 She is heartbroken to see her newborns fighting for their lives in the NICU on respiratory support. 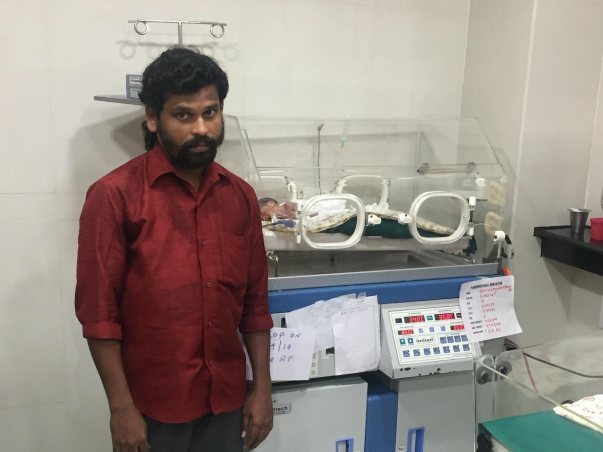 Balamurugan and Vijayalakshmi have had family troubles for most of the pregnancy. Yet the joy and excitement of meeting their children overshadowed the anxieties. 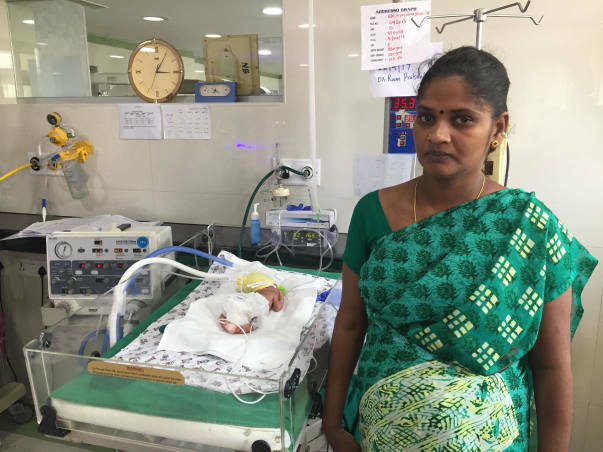 Everything was fine until Vijayalakshmi's water broke during her 7th month. She was admitted to the hospital where she was under round-the-clock care to watch her condition. At 29th weeks, she began to bleed. The twins are just under 20 days old. They need 1-2 months care in the hospital, treatment that Balamurugan cannot afford as a street soup vendor on an income of Rs. 500/day. The treatment is estimated to cost Rs. 10 Lakhs. This father has struggled to pool nearly Rs. 2.5 lakhs for medical expenses so far on loans from known circles. He needs financial aid in addition to emotional support so he can bring his children back home. "Vijayalakshmi is still recovering. She has pain from the surgery. After doing all the household chores including cooking, she had to come to the hospital to feed the children. She could not get up and wanted to lie down because of the pain. We are hardly able to manage during this time. All we have is each other, and with God's grace, support from people like you." Your contribution is the solace this family has been waiting for. Thank you for your tremendous support. This couldn't have been possible without you. It gives me inexplicable grief in informing you all that Twin A passed away due to complications. She had trouble breathing and was put on ventilator support, but even that didn't help. She was on ventilator for about 2 months before she left us all. However, it makes me hopeful and a little relieved in informing you all that Twin B is doing well. She is about 1.5 years old now. It is heartening to see her growing up healthy. The other twin 880 grams it recovering slowly and is likely to need another 3 weeks. Below is a picture of him. 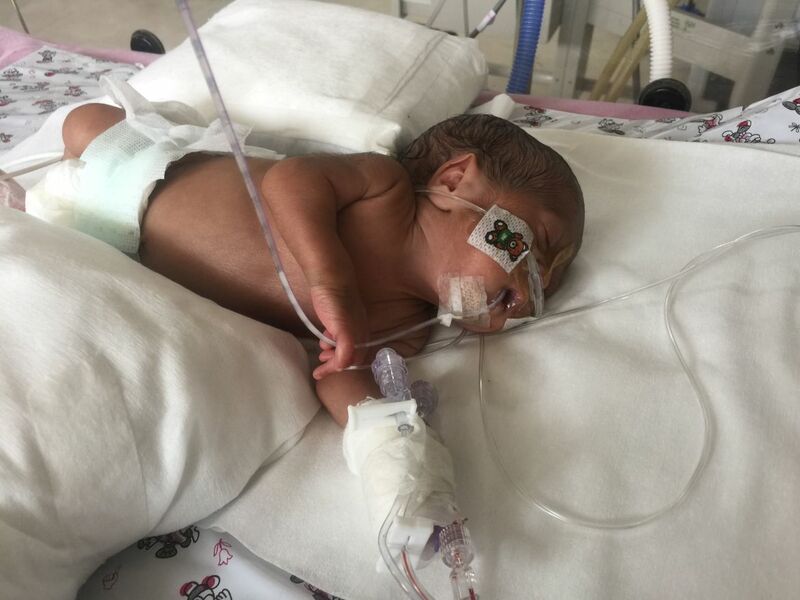 the other twin is making a slow but steady progress and is now 1.3 kgs from 850 grams at birth.This little one is still needing help to breathe.